The word “pickle" refers to a technique of preserving food in vinegar. By marinating food products in vinegar, they preserve and they absorb the flavors from its environment. 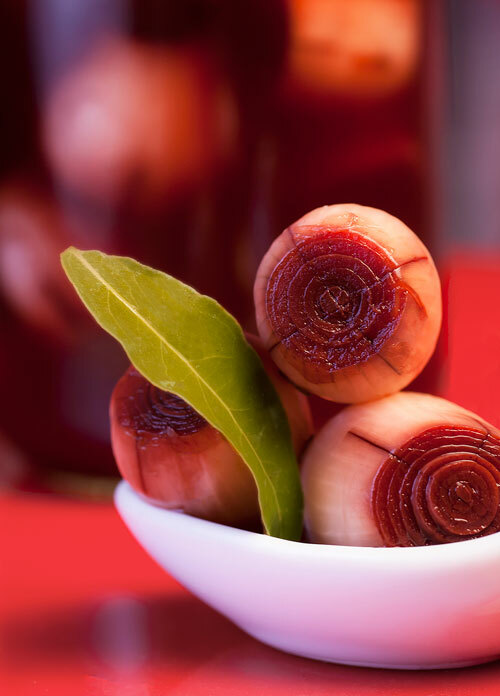 In this recipe the onions are going to absorb the mellow flavor of the red wine vinegar . This flavor will be complemented with pepper’s strong flavor and the fresh and piquant flavor the oregano and the clove – and as a final touch some light notes of balsamic flavor coming from the bay leaves. All these flavors are joined with the onions’ flavor to give as a result – the best pickled onions that you have tried. These onions can be served plain as an appetizer or they can be accompanied with diverse dishes like: tacos , salads , melted cheese , pot beans , grilled steak , Swiss enchiladas , etc. To make the pickled onions, you only have to work a bit with the onions and then all the ingredients are mixed – you won’t have any problem. The pickled onions are marinated with red wine vinegar. We recommend buying a cheap one because the expensive ones (aged) tend to turn the onions to a brown color. In the preparation of pickles and adobos it is common and advisable to use peppercorns instead of ground pepper, as it is more aromatic and it maintains longer the flavor. We recommend buying small onions for this recipe because those are the ones that are normally used. The preparation is of less than 10 minutes and the onions have to be left resting for 1 month. Recipe for 1.1 lbs of onions. Make an X cut on the superior and inferior part of 1.1 lbs of onions, then set aside. Add in a saucepan the enough water to cover all the onions with the ones you worked and bring it to a boil over high heat. When it boils reduce to medium heat, incorporate in the saucepan all the onions that were cut and leave them cooking in the hot water for about 4 minutes, until they soften a little. Transfer from the saucepan to a large glass jar, with a kitchen spoon, the onions that were cooked. 1/2 qt of Red Wine Vinegar. Leave the pickled onions marinating in a fresh and airy place or in the bottom part of the refrigerator for 1 month, so the flavors mix. The onions will be turning reddish due to the vinegar’s absorption. Shake the jar from time to time, so the onions mix with the pickle. * The pickled onions last approximately 2 months. Variations: There are infinite recipes that can be elaborated from this technique like the white pickled , pickled chipotle peppers , pickled chilies and vegetables , etc. Did you like the Pickled Onions? ᐉ Cook an Arrachera , you will love it. ᐉ Prepare a Nopal Cactus Salad to accompany these tasty onions. ᐉ Discover the Salsa Pico de Gallo. ᐉ Refresh yourself with a tasty Cantaloupe Water. Here are the Bay Leaves that you need for this recipe. In this jar the bay leaves are whole, they have a good aroma, a nice green color and the best is that they come from Turquey, its place of origin. These cloves are a beauty they have a very good aroma, a strong flavor and they remain fresh in the jar... you cannot ask for anything else. The “McCormick Oregano" is organic, it has a good flavor and its freshness is excellent for any recipe.